So, when the Castles of Burgundy first came out, it quickly became one of my favorite games. The combination of planning and the variance of the die rolls was a great fit for me. 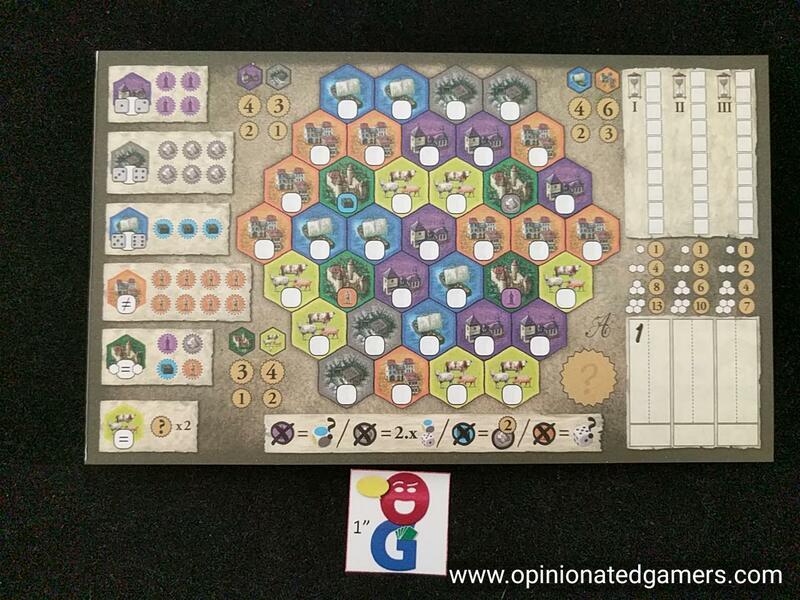 A few years ago, there was a Castles of Burgundy card game, and while it was fairly well received by other gamers, it felt (to me at least) that it was pretty much the same game – and, in fact, took up about the same amount of table space! This year, Ravensburger quietly rolled out a dice version of the game. As I have said many times already this fall, I was not able to do my usual amount of pre-SPIEL research, so I was actually surprised when I heard about this one at the Ravensburger press event on the Friday of the show. As I loved the base game, I was intrigued to try it out. In this small box version, each player gets a scoresheet which shows his own duchy. There are four different varieties of score sheet included in the pad (about 50 of each as the sheets are double sided), and in the game, the players are each supposed to play with the same layout. The hex shaped duchy is found in the middle of the sheet – like the base game, there are six different color types; and yes the light green pastures are still yellow on the dice. On the left are the scoring areas where you will mark your in-game achievements and abilities. There is also a nice reference of the placement rules for each of the six colors. The right side of the sheet has a timing track as well as a scoring area. Before the game starts, each player chooses one of the four castle hexes to begin in and takes the appropriate scoring bonus as well as special ability (more on these later). The game is played in three rounds, each split up into a number of turns. In each turn, the owner of the game rolls all five dice. There are two traditional d6 with pips, two dice with one face of each of the six colors and a timing die which has four single hourglasses and two sides with blue double hourglasses. These five dice are rolled, and the players first mark down the number of hourglasses on the timing track. Each of the three rounds will last for ten hourglasses – so anywhere between 5 and 10 rounds. Then, each player simultaneously chooses a pair of dice – one colored and one numbered – to use to build in their duchy. If they can make a valid pair – they will be able to build up their duchy. Each of the colors has their own set of rules for what is acceptable in that color, and there is also the general rule that you must build in a hex that is adjacent to one that you have already built in. (So, in the first round of the game, you are limited to building to the hexes adjacent to your starting castle). When you build in a hex, write the number that you used in the bottom. On the map, you will notice that the colors have multiple different areas of varying sizes in each color. If you finish filling in the final hex in one of these smaller areas, you will score bonus points for completion. Look at the scoring chart in the bottom right on the sheet to determine how many points you score – it varies based on the size of the small area completed as well as in which round you are in currently. You will also get a special ability corresponding to that color. If you have managed to fill in ALL the hexes of a color on your sheet, you will also score a bonus for the color. The first player in the game to do this scores the larger score, the next player will score the lower bonus score, and all other players after that will not get a bonus. You will start the game with a single special ability (From your initial castle) and get more throughout the game as you finish areas. You must remember that you can only use one special ability on any given turn! If you are unable to make a valid play, you will get an orange worker ability – so long as you have one remaining in that section of your sheet. Purple Monastery – must use a 1 or 2 on the numbered die and purple on the color die. If you finish the last purple hex in the area, you get purple bonus action – when used, it will allow you to change the color of a die when making a combination. You also score the completion bonus. Silver Mine – must use a 3 or 4 on the numbered die and silver on the color die. If you finish the last silver hex in an area, you score the completion bonus and get a silver ore. This can be used on a later turn to make a second combination from the rolled dice, thus allowing you to mark two hexes on your board. You may use one of the dice in both combinations, but you can’t use the SAME two dice. Blue River hexes – must use a 5 or 6 on the numbered die and blue on the color die. If you finish the last blue hex in an area, you get the scoring bonus as well as a commodity. On any later turn when the timing die comes up with the blue double hourglasses, you can sell all of their available commodities – receiving a silver ore and 2VP for each sold. Orange City hexes – must use the orange die, and the number used in the hex must not have been used yet in that particular grouping of orange hexes. If you finish the last orange hex in an area, you get the scoring bonus as well as an orange worker. On a later turn, you can use the worker to change the number on a die. Green Castle hexes – must use the green die, and a number which is found on any of the adjacent hexes. You score the bonus (always one point as the castle is always in an area of 1 hex), and then you get the special ability printed in the hex – purple monk, silver ore, orange worker or blue commodity. There are special spaces for there in the Green area on the left of your sheet. Yellow (well, really light green) Pasture hexes – use the yellow die and any number. However, all the yellow hexes in an area must use the SAME number. When you complete the area, you do not get a special action to use later – instead, you get double scoring for the completion bonus. When the tenth timing space of a round is filled in (any excess is not marked), the round will end after that turn. There really isn’t much that happens between rounds other than some changes in the area completion bonus scoring. After the end of the third round, you simply add up your points to see who wins. There are no end-game bonuses. The player with the most points wins the game. If there is a tie, the player with the most unused special actions remaining is the winner. So, at first glance (and on first play), it really feels like the base Castle of Burgundy. The interaction of using the different dice rolls really captures the spirit of the full boardgame. At first, I thought this was a negative – because, after all, why do I need a THIRD game which essentially does the same thing? However, after a few more plays, this version of Burgundy is really growing on me. First, and foremost, it’s a much smaller version of the game. Sure, it’s not quite as complex as the original, but you really do get the feel of most of it here. Unlike the Burgundy card game, which comes in a smaller box but still essentially needs a full table to play, the dice game is eminently portable. You need five dice, four pieces of paper and a few pens. It’s easily the sort of thing that you can slip in a jacket pocket (as I did on a recent trip) and then give yourself hours of fun on the nasty dirty carpet in an airport waiting for a five hour delay to elapse. Second, it’s actually pretty approachable. During the aforementioned weather delay, this happened to be one of the games that was in my jacket. We pulled it out, and we got in three games with some of the kids on the soccer team, and I thought it worked out really well. The non-gaming high schoolers that we showed the game to were able to pick it up by the end of the first game, and they were actually quite competitive at it by the second. Third, I am finding that I like the somewhat more simple approach that this game offers. You get a pretty decent space to make decisions, but the whole game fits in a 20-30 minute window. Furthermore, the game can be played solo and you challenge yourself to score the most points. 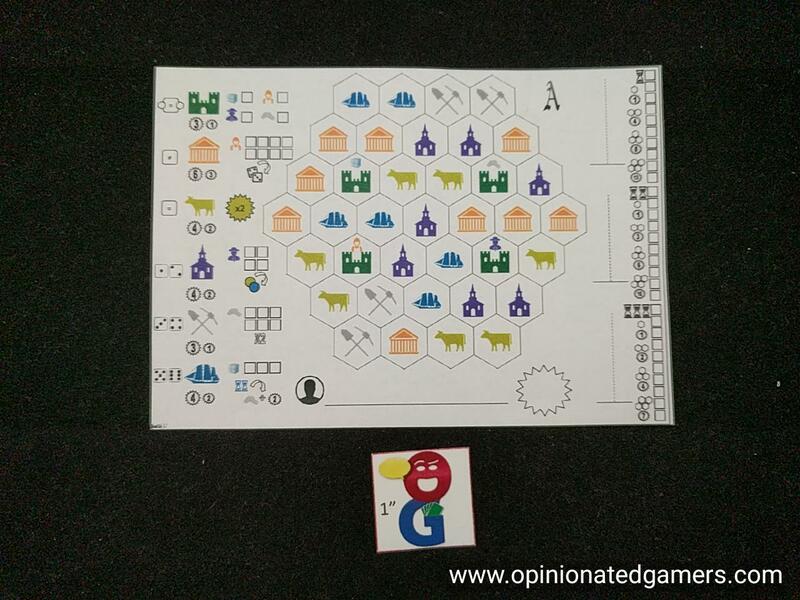 As I am wont to do, the scoring sheets are laminated and dry erase markers are used to write upon them – though I used the minimalistic ones available on BGG. It’s much better for the environment, and easier to put in my travel kit. Right now, I only have the A/B sheets in a double sided lamination pocket – we have been playing these two sides and it hasn’t gotten stale yet. At some point, I’ll get around to laminating the other two. I’m probably not ever going to use the real sheets which came with the game because I have so much problem actually using them and seeing my marks on the sheet. I must say that my rating of this game may border on “I love it” – because my newly laminated sheets saved the day last month. I was in the airport on my way to fly to a soccer tournament, and our flight was delayed for FIVE hours because our plane had been struck by lightning and had to be replaced with a less sizzling aircraft. The Castles of Burgundy dice game was one of the two games that I had stashed in my carry-on luggage that day, and it kept me and a number of the kids on the soccer team occupied through most of the delay. Joe Huber (1 play): I had the chance to hear about Castles of Burgundy: the Dice Game from the folks at Ravensburger during BGGcon, and got excited to try it. But for me, the game suffers from from an overabundance of constraints. 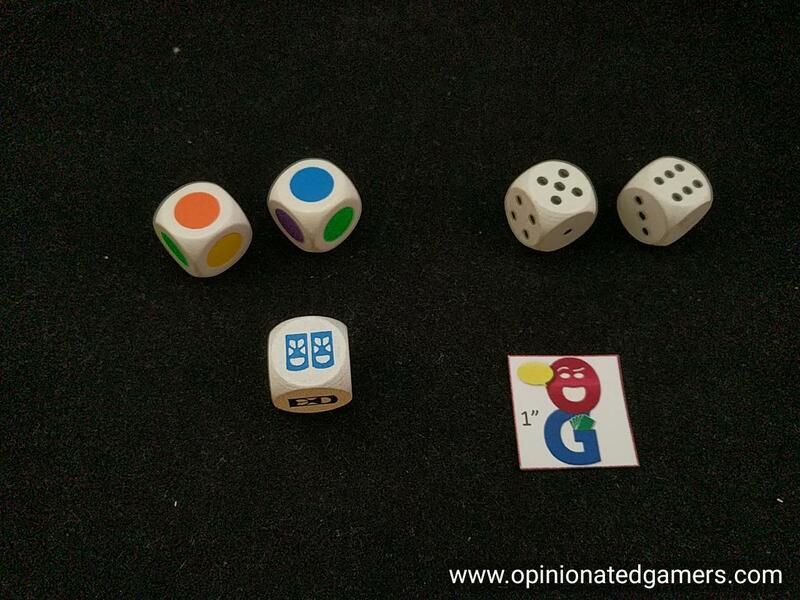 These constraints mean that even though the dice can be paired in many ways, a significant number of combinations are not useful. And because it’s possible to have turns with no options unless one holds on to dice manipulation powers. Which, in turn, makes spending a power when there is some legal option unappealing – and left me feeling underwhelmed. That said, better rolls would necessarily make for more options and more opportunity to interesting plays; it’s possible I was just unfortunate on my play. Fraser (1 play): I can’t believe the yellow face on the dice are meant to match the light green of the animals on the score pad! Possibly it is a homage back to the dodgy yellow and light green tiles that are difficult to tell apart in the original game unless you are using aircraft landing lights, if so it fell flat for me and was just annoying. The scorepad is double sided which is the first time I have seen one coming out of Germany and is a big plus. I found that the game itself flows reasonably well, but for my Burgen Burgen Burgen Burgen Burgen fix I would rather play the original board game and for a roll and write I would prefer to play Qwixx or 21. Melissa (2 plays): I was luke-warm on Castles of Burgundy: The Card Game (same time to play, more table space = fiddlier), but I quite like this (AKA Würfel Würfel Würfel Würfel Würfel). It’s a bit fiddly, and the player sheet is very busy (do we really need all the pictures on each space? 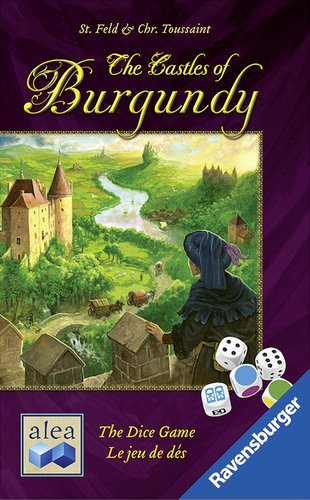 ), but it plays quickly and really does capture the feel of Castles of Burgundy. 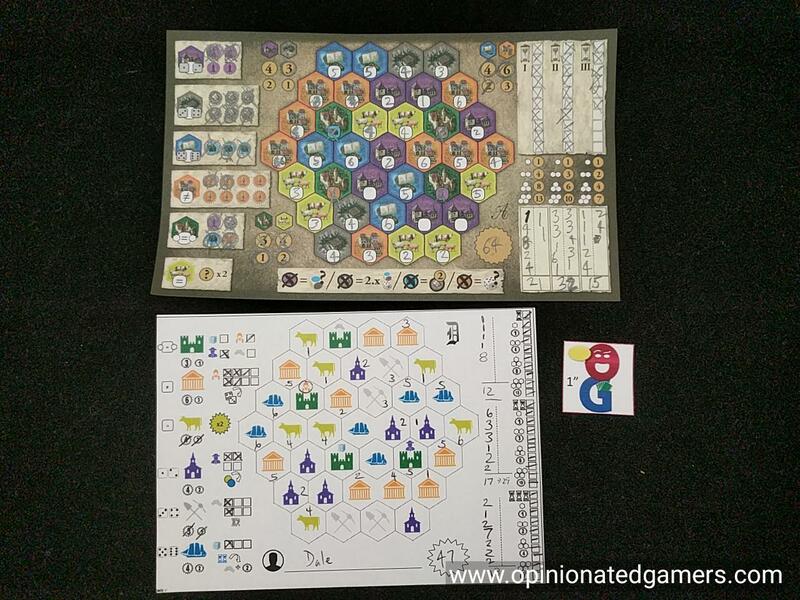 I’ll look on BGG for this simplified player sheet – that might help. I’d quite like an option to spend three bonuses to get a double bonus once during the game.